I saw my first FA Cup Final in 1976. I was seven years old, and only caught it by accident, tuning in while looking for something else. The match was already long into its second half, and I’d missed all of the game’s goals. Being British, I found myself cheering on the losing team, and, because it was the first football of any kind I’d seen, that losing team became MY team, and so they’ve stayed to this day. So my team came to me by accident too, and had I seen my first final only a year earlier, my team would have been Fulham. The FA Cup Final became a family affair after that. We’d get together – my aunt, my parents and my sister – and watch the game over crisps and ice cream soda (I imagine my stepfather drank beer, but I don’t remember). 1977 was pure celebration, as the last year’s losers came back to claim the trophy at last: in 1978, we were all cheering for Ipswich, and 1979 was all tantrum and heartbreak. In later years, we got behind QPR, Manchester City, and, rewarded at last, Coventry City. So I’m no stranger to shouting for the underdog. But just lately, I’ve been wondering why. Since the BBC started showing highlights from all FA Cup games in those late-night marathon editions of Match of the Day, we’ve all got to know a lot more about the smaller clubs in our national game. Some, like Yeading, are very small indeed. Others, like Blackpool, have merely fallen on hard times. They all have their own stories and their own dramas, and these can come as a welcome relief from our over-familiarity with repetitive Premiership story-lines. But I can’t be the only one who is beginning to feel that the way these stories are put across is beginning to drag in a big way. 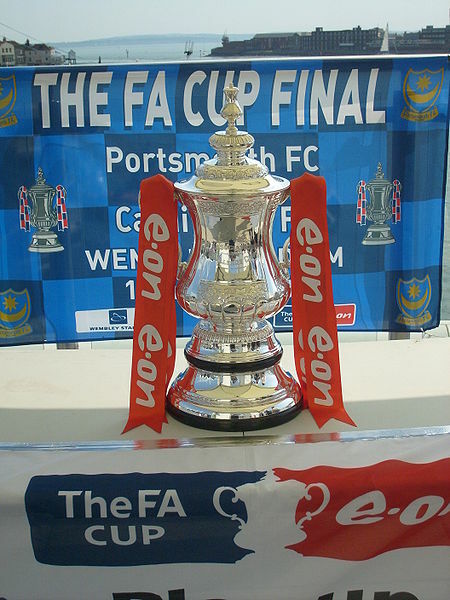 The Beeb has a fixed idea of what the FA Cup – especially in the early rounds – means. It means the little dog against the big dog. It’s true – of course it’s true – but in the last two years this plot line has been heavily overcooked. It is dragged out in every single instance of a game between two teams from different levels of the football ladder. When the Premiership teams enter the competition in the Third Round, that can be up to twenty games in which we are, in the Beeb’s script, on the edge of our seats waiting for a shock. I can’t keep it up, and find myself longing for the Premiership side to hand out a beating. What’s more, in just about every single case, the underdog is presented in the same way. It is always a club “at the centre of its community”. That “community” will have “cup fever” and because there aren’t enough tickets to go round, will be seeking out funny/dangerous places in trees, on top of neighbouring buildings, hanging from lamp posts etc. in order to witness the game. The players themselves will be the true salt of the earth – much will be made of the “ordinariness” of their day jobs (and if they are full-time players, the gap will be filled with stories of how they were foolishly rejected by this or that top club and now have the chance to prove to said club how wrong they were). They will be builders, postmen, lumberjacks… white (usually) working class men, usually despised by the BBC as racist redneck provincials driving dangerously in white vans, who for ninety minutes will be presented as the true face of the good old English nation. The manager will either be young and upcoming, given a golden opportunity for a shot at the big time (which never comes) or he’ll have been at the club since 1945 and will be a “local character”, a typical English eccentric of the kind the BBC usually mocks and can hardly bear not to here. Any kind of link to the sort of football history that the Beeb presumes that the viewer will know about will be grossly over-emphasised. This last reached its disgusting apogee this season in the match between Nigel Clough’s Burton Albion and Manchester United, during which Brian Clough’s ghost was kept on constant, mawkish duty. And then there’s that Beeb obsession with the question of haves and have-nots. It starts with some tortured statistics about how the entire team cost less than one week of the opposing goalkeeper’s wages. It ends with the merest hint at something sinister about the way the wealthier club made its money… about the way the top players made it there… against all of which the poorer team in all its yeoman honesty and traditional values is supposedly to be contrasted. It’s all getting a bit wearing. For a start, none of it bears much relation to reality. The gap in quality between non-league, non-Premiership teams and the elite has closed, the games are usually close and whilst shocks are still relatively rare they lack the thunderbolt quality of Wrexham-Arsenal or Yeovil-Sunderland of yore. It’s been many, many years since any club – let alone any small club – has been the focus of their town (and let’s just drop that word “community”, with all its false implications). If the BBC could take the time, and clear their heads of their fairytale approach to the FA Cup, there are fresh and genuine stories to every game. Take Yeading. It’s a very young club – only forty years old, and it’s in a “new” part of the south east of England, with no previous history of football (Hayes in Middlesex). The story of Yeading is part of an as-yet untold story about post-War working class Britain. What about the aforesaid Burton Albion? The Beeb assures us that this is an age when the haves take everything from the have-nots, yet Burton is a club to demonstrate that competent management can build a successful, viable club away from traditional football hotbeds – they have a new ground, the Pirelli stadium, that couldn’t be less like the Beeb’s romantic idea of what a non-league club should possess (a potato field next to a pub, essentially). Nigel Clough isn’t their first competent manager – they have also benefitted from Peter Taylor, who has managed England, and Neil Warnock, who looks likely to return Sheffield United to the top ranks this year.